The Mississippian culture is what archaeologists call the pre-Columbian horticulturalists who lived in the midwestern and southeastern United States between about AD 1000-1550. Mississippian sites have been identified within the river valleys of nearly a third of what is today the United States, including an area centered in Illinois but found as far south as the Florida panhandle, west as Oklahoma, north as Minnesota, and east as Ohio. The term Mississippian is a broad umbrella term that includes several similar regional archaeological cultures. The southwestern portion of this huge area (Arkansas, Texas, Oklahoma and adjacent states) is known as Caddo; the Oneota is found in Iowa, Minnesota, Illinois and Wisconsin); Fort Ancient is the term referring to Mississippian-like towns and settlements in the Ohio River Valley of Kentucky, Ohio, and Indiana; and the Southeastern Ceremonial Complex includes the states of Alabama, Georgia, and Florida. At a minimum, all of these distinctive cultures shared cultural traits of mound construction, artifact forms, symbols, and stratified ranking. Mississippian cultural groups were independent chiefdoms which were primarily connected, at varying levels, by loosely organized trade systems and warfare. The groups shared a common ranked societal structure; a farming technology based on the "three sisters" of maize, beans, and squash; fortification ditches and palisades; large earthen flat-topped pyramids (called "platform mounds"); and a set of rituals and symbols referring to fertility, ancestor worship, astronomical observations, and war. The archaeological site of Cahokia is the largest of the Mississippian sites and arguably the main generator for most of the ideas that make up Mississippian culture. It was located in the segment of the Mississippi River Valley in the central United States known as the American Bottom. In this rich environment just east of the modern day city of St. Louis, Missouri, Cahokia rose to become an enormous urban settlement. It has by far the largest mound of any Mississippian site and held a population of between 10,000-15,000 at its heyday. Cahokia's center called Monk's Mound covers an area of five hectares (12 acres) at its base and stands over 30 meters (~100 feet) tall. The vast majority of Mississippian mounds in other places are no more than 3 m (10 ft) high. Because of Cahokia's extraordinary size and early development, American archaeologist Timothy Pauketat has argued that Cahokia was the regional polity which provided the impetus for the incipient Mississippian civilization. 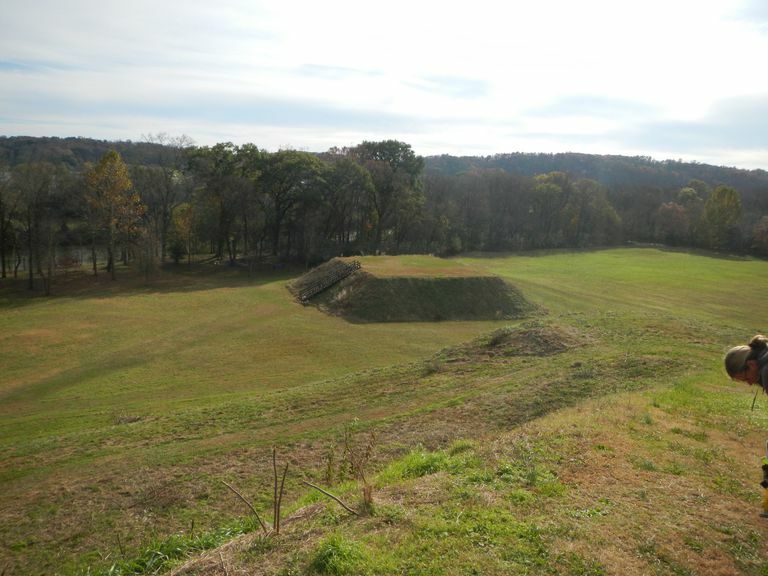 Certainly, in terms of chronology, the habit of constructing mound centers began at Cahokia and then moved outward into the Mississippi Delta and Black Warrior valleys in Alabama, followed by centers in Tennessee and Georgia. That is not to say that Cahokia ruled these areas, or even had direct hands-on influence in their construction. One key identifying the independent rise of the Mississippian centers is the multiplicity of languages that were used by the Mississippians. Seven distinct language families were used in the Southeast alone (Muskogean, Iroquoian, Catawban, Caddoan, Algonkian, Tunican, Timuacan), and many of the languages were mutually unintelligible. Despite this, most scholars support the centrality of Cahokia and suggest that the different Mississippian polities emerged as a combination of a product of several intersecting local and external factors. What Connects the Cultures to Cahokia? Archaeologists have identified several traits connecting Cahokia to the vast number of other Mississippian chiefdoms. Most of those studies indicate that Cahokia's influence varied over time and space. The only true colonies established identified to date include about a dozen sites such as Trempealeau and Aztalan in Wisconsin, beginning about 1100 AD. American archaeologist Rachel Briggs suggests that the Mississippian standard jar and its usefulness in converting maize into edible hominy was a common thread for Alabama's Black Warrior Valley, which saw Mississippian contact as early as 1120 AD. In Fort Ancient sites, which Mississippian immigrants reached in the late 1300s, there was no increased use of maize, but according to Americanist Robert Cook, a new form of leadership developed, associated with dog/wolf clans and cult practices. The pre-Mississippian Gulf Coast societies seem to have been a generator of artifacts and ideas shared by the Mississippians. Lightning whelks (Busycon sinistrum), a Gulf Coast marine shellfish with a left-handed spiral construction, have been found at Cahokia and other Mississippian sites. Many are reworked into the form of shell cups, gorgets, and masks, as well as marine shell bead making. Some shell effigies made from pottery have also been identified. American archaeologists Marquardt and Kozuch suggest that the whelk's left-handed spiral may have represented a metaphor for the continuity and inevitability of birth, death, and rebirth. There is also some evidence that groups along central Gulf Coast made stepped pyramids before Cahokia's rise (Pluckhahn and colleagues). Scholars are divided on the political structures of the various communities. 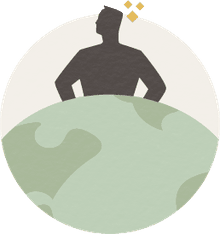 To some scholars, a centralized political economy with a paramount chief or leader appears to have been in effect at many of the societies where burials of elite persons have been identified. In this theory, political control likely developed over the restricted access to food storage, labor to build platform mounds, craft production of luxury items of copper and shell, and the funding of feasting and other rituals. Social structure within the groups was ranked, with at least two or more classes of people with different amounts of power in evidence. The second group of scholars is of the opinion that most Mississippian political organizations were decentralized, that there may have been ranked societies, but access to status and luxury goods was by no means as imbalanced as one would expect with a true hierarchical structure. These scholars support the notion of autonomous polities who were engaged in loose alliances and warfare relationships, led by chiefs who were at least partly controlled by councils and kin- or clan-based factions. The most likely scenario is that the amount of control held by elites in Mississippian societies varied considerably from region to region. Where the centralized model probably works best are in those regions with clearly evident mound centers such as Cahokia and Etowah in Georgia; decentralization was clearly in effect in the Carolina Piedmont and southern Appalachia visited by 16th-century European expeditions. Alt S. 2012. Making Mississippian at Cahokia. In: Pauketat TR, editor. Oxford Handbook of North American Archaeology. Oxford: Oxford University Press. p 497-508. Bardolph D. 2014. Evaluating Cahokian Contact and Mississippian Identity Politics in the Late Prehistoric Central Illinois River Valley. American Antiquity 79(1):69-89. Briggs RV. 2017. The Civil Cooking Pot: Hominy and the Mississippian Standard Jar in the Black Warrior Valley, Alabama. American Antiquity 81(2):316-332. Cook R. 2012. Dogs of War: Potential Social Institutions of Conflict, Healing, and Death in a Fort Ancient Village. American Antiquity 77(3):498-523. Cook RA, and Price TD. 2015. Maize, mounds, and the movement of people: isotope analysis of a Mississippian/Fort Ancient region. Journal of Archaeological Science 61:112-128. Marquardt WH, and Kozuch L. 2016. The lightning whelk: An enduring icon of southeastern North American spirituality. Journal of Anthropological Archaeology 42:1-26. Pauketat TR, Alt SM, and Kruchten JD. 2017. The Emerald Acropolis: elevating the moon and water in the rise of Cahokia. Antiquity 91(355):207-222. Pluckhahn TJ, Thompson VD, and Rink WJ. 2016. Evidence for Stepped Pyramids of Shell in the Woodland Period of Eastern North America. American Antiquity 81(2):345-363. Skousen BJ. 2012. Posts, places, ancestors, and worlds: dividual personhood in the American Bottom region. Southeastern Archaeology 31(1):57-69. Slater PA, Hedman KM, and Emerson TE. 2014. Immigrants at the Mississippian polity of Cahokia: strontium isotope evidence for population movement. Journal of Archaeological Science 44:117-127. Why Did the Hopewell People Build Enormous Mounds? Before the Europeans Came, What Was Life Like in the American Midwest? Did the "Aryans" Exist and Did They Destroy the Indus Civilization? Why did Folsom Hunters Make Such Beautiful Projectile Points? Cucumbertree is a magnolia that grows from Canada to Florida. Where did Hernando de Soto and Chief Tascalusa Battle for America?